The first meeting of the Technical Advisory Group (TAG) for the Farming in the Floodplain Project (FFP) was held on April 5, 2016 at the Puyallup Library. 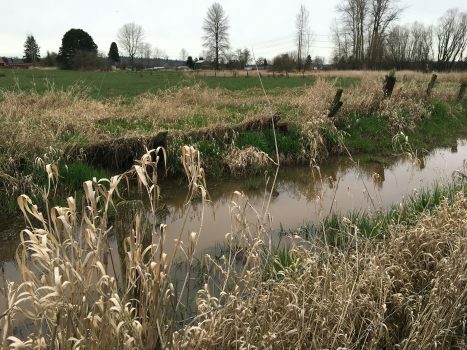 About 25 people participated, including Clear Creek area farmers, Pierce County staff, Farming in the Floodplain Project staff, and regional technical experts. The meeting was led by PCC Farmland Trust and by ESA, the technical contractors working on the project. Topics discussed at the meeting included the purpose and structure of the FFP; agriculture in the Clear Creek area; agricultural viability; concerns, opportunities, and information needs in the Clear Creek area; and observed trends and projections in the Puget Sound area and the Puyallup Watershed. assistance in reaching a compromise allowing for the construction of agriculturally-specific and flood-conscious structures in the Clear Creek area. Information, questions, and conversations at the TAG meeting will be used by ESA to inform an Existing Conditions Report. Ideas for future technical work, including those presented by the Clear Creek Farmers Collective, will be used to develop the scope of work for the next phase of technical analysis scheduled to begin in August 2016.